As part of an eighth grade English assignment, my teacher Ms. Barton asked us to read a book from a pre-chosen list. My friend Darren, a soccer jock, asked if he could choose a book from off the list claiming many of his friends had recommended “My Side of the Mountain.” Ms. Barton smelled a rat. “You and your friends have a lot of literary conversations, Darren?” It was a wry dig, and I recall it often in the Peace Corps when my friends and I are actually having literary conversations. For many of us, reading was one of the perks of joining the Peace Corps; in addition to the travel, the meeting new people, the solitude, there’s also the books. And since Peace Corps has had a presence in Samoa for over 40 years, we’ve acquired quite a collection. The walls of the volunteer resource room are lined with books, as are the walls of the hallway leading to the resource room, as are the walls of the hallway leading to the medical officer’s office, as are the walls of the Savai’i office. 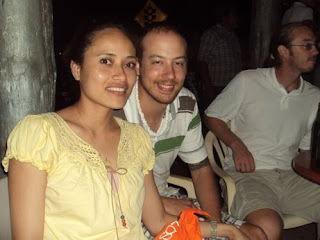 Selection can be a little dicey sometimes; Borders Peace Corps Samoa is not. Looking through the shelves can feel like picking through the t-shirts at Good Will: it takes a lot of looking to find the duke among the duds. And while it’s not scientific by any means, the more available a certain book, the more its literary quality is called into question. Many of us are book kleptomaniacs with knack for hoarding, yet there were four copies of “Water for Elephants” on the shelf a few weeks back. Telling? Perhaps. I’m a slow reader. In addition to taking longer to get through a page than everyone else, in The States I often found it difficult to find time to read. There was so much TV to be watched, so much Internet to be surfed, so much driving to the grocery store to relish. But since few volunteers have televisions and most of us lead hermit-like lifestyles, there’s a lot of down time in the Peace Corps which allows for quite a bit of reading—even for Slowskis like me. Though there are many books from many genres available, I’d call non-fiction adventure the genre of choice among volunteers. Right now I’m reading David Grann’s “The Lost City of Z,” which my dad brought when he came to visit. I will almost surely pass it on when I’m finished. Next I think I’m going to read Dave Eggers’s “A Heartbreaking Work of Staggering Genius” because other volunteers keep trying to steal it from me… Like I said, Peace Corps volunteers are a bunch of snobby literary kleptos. I hope you’re finding time to read too. Pictures below. 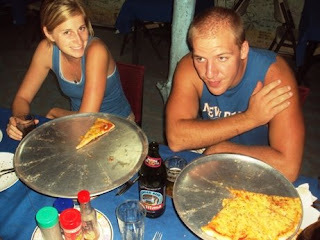 Erin and Dan and Pizza. These guys are eye doctors and former Peace Corps! They were group 67. Crazy. 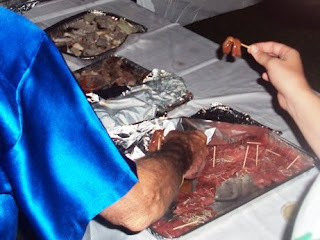 Sashimi tray at the tourism authority's launch on Friday night. Pizza beer. 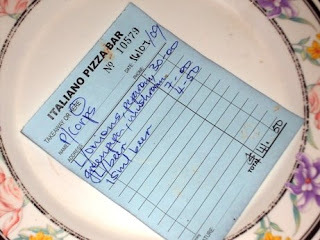 The waitress named us "P/Corps". 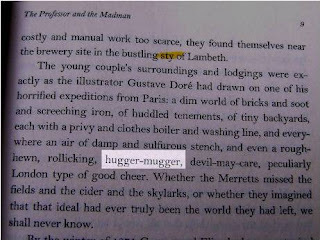 The word "hugger-mugger" came up in a book I was reading recently. We played Dictionary in high school once and Brian chose hugger-mugger. It's the first time I've ever seen it used in an actual sentence. Hey! I liked Water for Elephants. 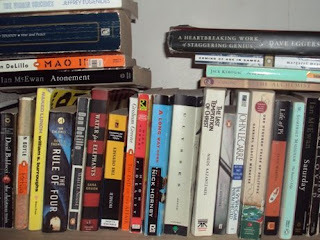 You know, many of the PCVs list the books they read in a list on their blogs. I can just imagine they are listing just the high brow, learned, lofty type books they have ploughed through, and leave off the comic books, graphic novels and back of cereal boxes they probably prefer!! (Just kidding, you all probably read Proust, in French! ).